Chinese New Year, Chinatown, London, originally uploaded by Craig Grobler. 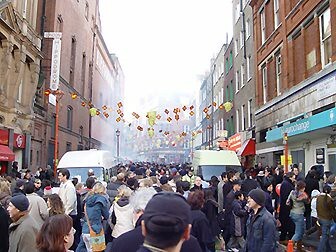 Celebration for Chinese New Year of the Dog begins with a parade, starting at 11am, along Charing Cross Road to Trafalgar Square. The parade features the Gold Sail Dance group from Beijing plus London based performers including Jun Mo. They could not have made it any easier, but I still missed the parade. Damn and its year of the Dog, my year. Didn't want to stick around till the 5pm fireworks, so I went to Gym instead.